Does Microsoft's Surface tablet live up to the hype? "Ma'am, we need you to take the laptop out of the bag," the TSA agent says as he hands me my backpack. But I've already taken my laptop out of the bag. All that's left inside are an iPad and Microsoft's Surface tablet. He pulls out the Surface with its Touch Cover on top and says "It's a laptop, right? It needs to go through in its own bin." I pull the keyboard off the Surface and toss the two pieces -- tablet and keyboard -- into a bin. Microsoft's Surface RT ($499) is a 10.6-inch tablet that runs Windows RT, a version of Windows 8. It is also more than a tablet when you pay an extra $100 and get the Touch Cover with a built-in keyboard that clicks onto the bottom of the tablet. Microsoft has spent millions of dollars and hours perfecting the Surface hardware and software so people will, well, replace both the iPad and the laptop in their carry-on bags. I don't worry about tossing – and I mean really tossing -- the Surface into the bin. That's because a few days earlier I watched the tablet fall 30 feet onto the floor of Microsoft's testing lab. Constructed of VaporMg, a new material engineered by Microsoft, the tablet is built to withstand the toughest bumps and bruises. And it feels really durable when you hold it; there's no flex to the screen or the back casing. The screen itself is covered with durable Gorilla Glass, too. And yet, despite the rough-and-tough build, the tablet is only 0.06 pounds heavier than the new iPad, and even then it has a full-sized USB port, mini-HDMI port, larger screen and built-in stand. According to the spec sheets, it's the same thickness as Apple's tablet, but the way the edges flare inward, it actually appears a bit thinner. The tablet is much taller than the iPad since Microsoft used a 10.6-inch screen to accommodate a wider keyboard and to provide more horizontal space for the software. iPad users will notice the difference instantly; when holding it horizontally, your hands are further apart and it's a wider tablet to manage. New iPad owners will also notice the difference in the display. While the display on the Surface appears to be just as bright and vibrant, its 1366 x 768 resolution screen doesn't always make for as crisp a picture as the iPad's Retina display. Having become a master at creating a pillow stand for my iPad, I've been delighted with the kickstand that pops out of the Surface back. The metal stand lies flush with the tablet when it isn't in use, but when you extend it, it holds the tablet almost vertically. Unfortunately, you can't adjust the angle and it's harder than it should be to pull out the metal stand. (My manicure didn't appreciate it!) But whether it is propping the tablet up on a plane's tray table or in bed, it's an extremely handy feature. Both that wider screen and the kickstand help set the stage for the last important piece of hardware: the attachable keyboard covers. The Touch Cover is a lot like Apple's Smart Cover – it uses strong magnets to latch onto the bottom of the tablet – but there's a keyboard built into the seriously skinny 3mm cover. The keyboard is flush with the cover, but underneath it lies a thin layer of touch sensors. It creates an entirely new typing experience – one that falls between typing on the glass of a tablet and a regular keyboard. At first, typing on the tablet cover felt odd. It took me about two hours to get entirely comfortable but now, after a week's experience, I am able to type 75 words per minute. That's less than I type on a regular keyboard but about equal to my speed on some popular iPad keyboard covers. The magnets attaching the cover and the tablet are so strong that you can even hold the tablet upside down by just holding the cover. 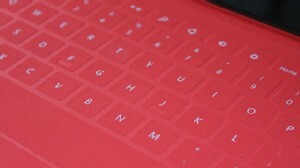 There's also the Type Cover, which is similar to a traditional keyboard with physical keys. I can type faster -- 86 words per minute – on the Type Cover but it isn't nearly as much fun to use as the Touch Cover. Both covers have small trackpads that are useful when navigating cramped menus in Office 2013. They support two-finger scrolling, but not pinch-to-zoom. The Touch Cover, which is available in a number of colors, flips over the tablet to make it appear like a book. Word to the wise: The white cover is a lot like white socks; it gets dirty easily, so expect to clean it often. The tablet's hardware is top-notch, but what about the software? The Surface runs a stripped-down version of Windows 8. Called Windows RT, it is designed for tablets with lower-powered ARM processors, like the ones that power smartphones and tablets. Unlike Windows 8 for Intel and AMD processors, you can only download apps through the Windows Store; no programs or apps through the Web browser. It comes loaded with Office 2013, which includes Word, Powerpoint, Excel, etc. Otherwise, Window RT gives you all the other features of Window 8: the Start Screen, which consists of different live tiles or apps, the ability to lock apps side-by-side and swipe in apps from the left. While it includes a traditional Desktop screen, you can only run Office programs from it. 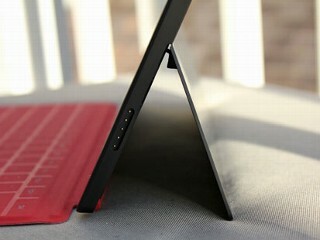 The Surface pushes Windows 8's general interface along smoothly, and the architecture lets it function like the iPad or smartphones. It boots up in under 30 seconds, resumes from sleep in under three seconds, and lasts nearly nine hours on a charge when playing video. (I got considerably less battery life when just using it to write and surf the web). This isn't like the PCs you have come to know; there's no time to get a cup of coffee as it boots or the need to drag a clunky charger everywhere. However, the software can get sluggish, especially when you're opening apps or running more than a few of them or typing with Microsoft Word. Many times while typing this review on the tablet, I would input a series of words and the tablet would take a few seconds to catch up with my typing. The system can also get bogged down fairly easily, causing small graphical glitches. With the keyboard attached, you come to expect laptop performance of the Surface and it can't always keep up. (I haven't noticed these performance issues on any of the Intel-powered, Windows 8 Pro tablets or laptops I have been testing over the last few weeks.) Microsoft says there should be an update soon to address the issues. But even when the keyboard is detached, I found myself getting frustrated by something else -- the lack of applications available in the Windows Store. Now, Microsoft is promising many more apps on Windows 8 launch day (Oct. 26) but as of this writing the apps I use most frequently on my iPad-- including Facebook, Twitter, Flipboard, Yelp, and news apps -- were missing from the store. While there is a selection of games, there's no Words with Friends, Scramble with Friends, etc. Yes, you can access the websites for many of those services through the browser, but those aren't very touch friendly, and when the keyboard is detached, you want a more finger-friendly experience. Over the past few weeks Microsoft has announced Skype, Netflix, Hulu Plus, Angry Birds and other key apps, but there's no saying when other big-name apps will come along. Also, remember that because you're unable to download other apps through the browser, you are limited to what is in the Store. The Surface isn't a laptop as the TSA agent thought, but it isn't a tablet either. 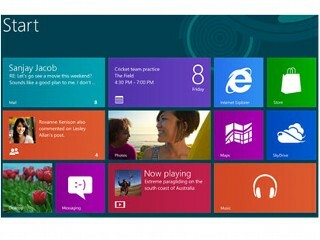 It's a whole new category of computer, one of many coming out with Windows 8 this week. It has the potential to change how we use our devices – to be a tablet to lean back with on the couch and a full computer when you click in the keyboard. But only part of its potential is fully realized at this point, and that's the hardware -- ironic for Microsoft, a software company. Windows RT is new and it shows; there are still performance kinks and the disappointing app selection limits the tablet in its functionality, despite its full version of Microsoft Office. Other full Windows 8 tablets and computers, like Acer's W510 and even the Surface Pro coming in January, are more appealing at this point because of their full Windows 8 software. The Surface is full of potential, but until its software performance and apps are as strong as its hardware, I, unfortunately, will still drag both a laptop and an iPad through security.